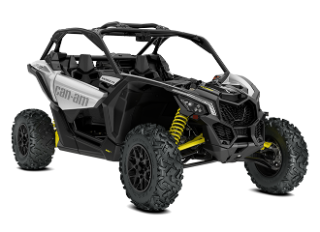 The Maverick X3's intensity comes from a mix of performance-driven mechanical and structural design, from its signature LEDs to its advanced cockpit. Choose between Hyper Silver & Sunburst Yellow painted coloration or White coloration, if you can. Roll on with strong 14-in aluminum wheels and 28-in Maxxis Bighorn 2.0 six-ply tires. Built to withstand rough terrain, sturdy lugs and a non-directional tread pattern ensure a smoother ride. 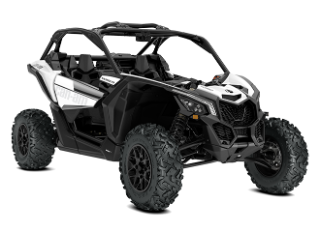 The Maverick X3 features FOX 2.5 Podium HPG Piggyback shocks with front and rear QS3 compression adjustment and rear bottom-out control for a balanced, factory-honed setup right out of the box. 131 x 64 x 66 in.